Scroggs has worked passionately with the small business community since 2003. 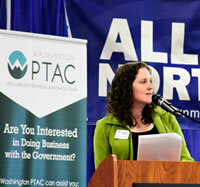 She joined the Washington PTAC in 2007 as a procurement counselor and in 2012 took the helm as Program Manager, overseeing eleven counselors at eight locations across the state. She has BA in Communication from Western Washington University and a Master’s Degree in Public Administration from Evergreen State College. She is certified by APTAC as an Associate Contracting Assistance Specialist and the U.S. Department of Veterans Affairs (VA) as a Verification Assistance Counselor. You can find Tiffany at the “Sell to the Government” class.